Do you and your kids like hands on math? I am always quick to pull out standard materials such as base ten blocks or play money, but sometimes I want to model math with something unique. 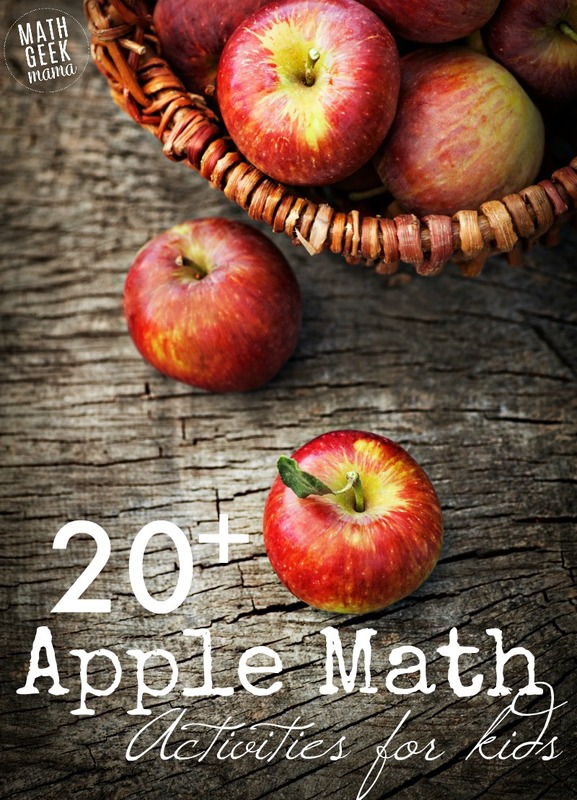 Apples provide a simple and tasty math manipulative. 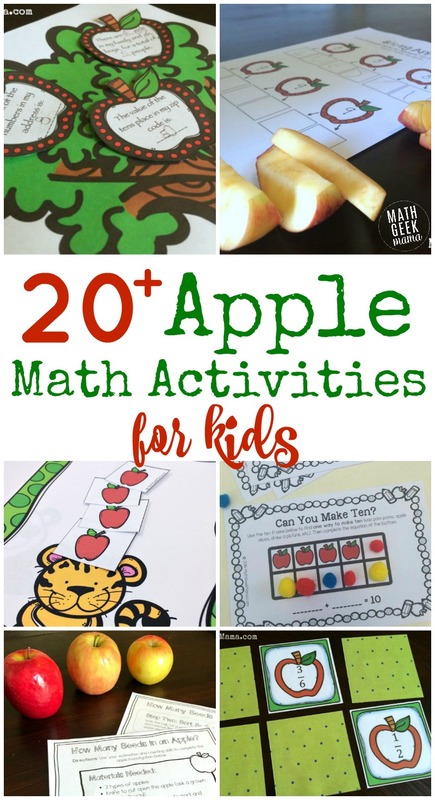 Apple math games or activities are perfect at the beginning of the school year, or anytime in the fall. They’re also fun during an apple unit study. And what I love is that they can be used to teach and explore all sorts of important math concepts. Below you will find hands on apple math activities, apple themed math games and apple STEM ideas for kids of all ages. Slicing Apples: Compose & decompose number with apple slices and these simple cut & paste pages. Apple Ten Frame Games: This visual games use ten frames and small objects to model the ways to make ten. For greater fine motor practice, use apple seeds as the manipulative. Make Patterns with Apple Prints: This is a fun, hands on combination of math and art! Falling Apples Game: This fun activity helps kids practice composing numbers and writing addition sentences. Apple Number Circles Games: These simple apple numbers can be used for a variety of math games, from counting and number recognition to composing and decomposing numbers. Measuring Apples: This simple printable can be used to weigh and measure different types of apples. Apple Fractions: This article shows how to explain basic fractions in a hands on way using apples. Want more HANDS ON learning with apples? 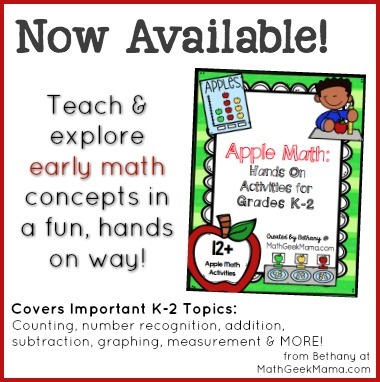 Grab my complete Apple Math resource! Ten Apples Up On Top Board Game: This printable board game is perfect for counting, addition & subtraction and is perfect to play along with the book by Dr. Seuss. Apple Tree Addition Coloring Pages: This set of low prep coloring pages will help kids learn all the ways to compose different numbers. Put the Apples On the Tree Game: This simple game can be played with preschoolers, but also adapted for older kids. Apple Equivalent Fraction Matching Game: These simple, apple themed cards are an easy way for kids to practice recognizing equivalent fractions. Fraction Apples: Explore fractions with this apple printable and activity. Apple Race Game: This printable helps kids count, graph and compare. Apple Trees for Counting & Addition: These cute printables can be used for counting practice or early addition. Apple Seed Counting: These simple mats are great for counting and fine motor practice. Plotting Points on the Coordinate Plane: This fun graphing challenge will result in a picture of an apple. Build an Apple Tower: Using simple materials, can your kids build a tower that stands out of apples? Grab the free printable download to help guide this challenge. Balancing Apples: In this challenge, kids create an apple out of a paper plate and try to balance it on their finger. Build LEGO Apples: This is a fun challenge for kids who love LEGO Bricks! Erupting Apple-Cano: Make a volcano out of an apple and learn about a cool twist on a classic chemical reaction. Apple STEM Challenges: Find 3 quick and easy challenges using apples in this post. What are some of your favorite apple math games or challenges? Share in the comments!